It was the title that did it: Myth Dealing. Those three syllables hooked me. After I took on the assignment, I spent days slowly immersing myself back into the myths that I knew. I was so excited that I arrived half an hour early for the Myth Dealing vernissage last week at Espace Pop. I stepped inside the gallery and was immediately surrounded by the artwork. The room was small, which required the seven art pieces to be displayed close to one another, creating a visual unity and a story bigger than the individual artworks. First-time curator Maggie Mills initially imagined Myth Dealing with an open mind. She wanted the exhibition to explore the multiple facets of craft media and its resonance with different mythologies, all while challenging the traditional aesthetic hierarchy. She explained that her interest in feminist art history led her to craft, adding that a lot of media that’s traditionally associated with craft is also feminised and it tends to rank lower on the aesthetic hierarchy of traditional ways that people think about art. 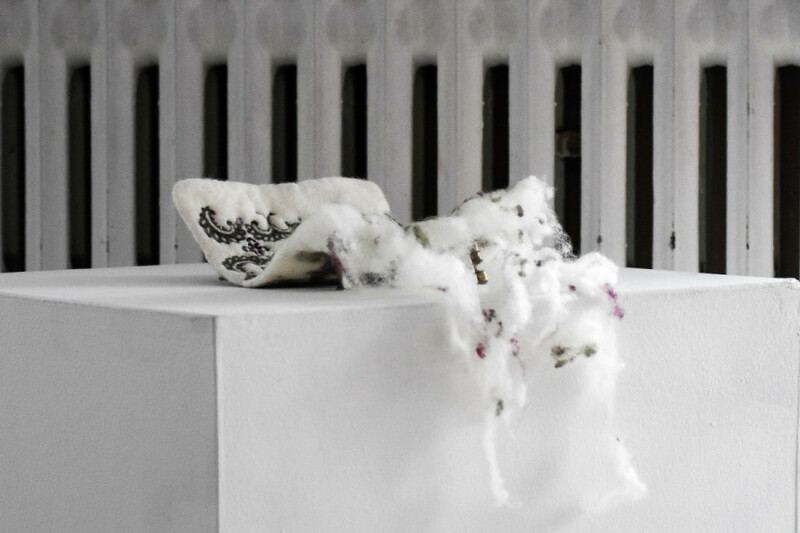 Delicate sounds from artist Saba Heravi’s featured work, Still Life of Memories, drew me to her artwork: a ceramic piece accompanied by a video projected on the wall behind it. The video itself was a loop of the artist putting things into a suitcase, closing it, opening it again, and unpacking everything. 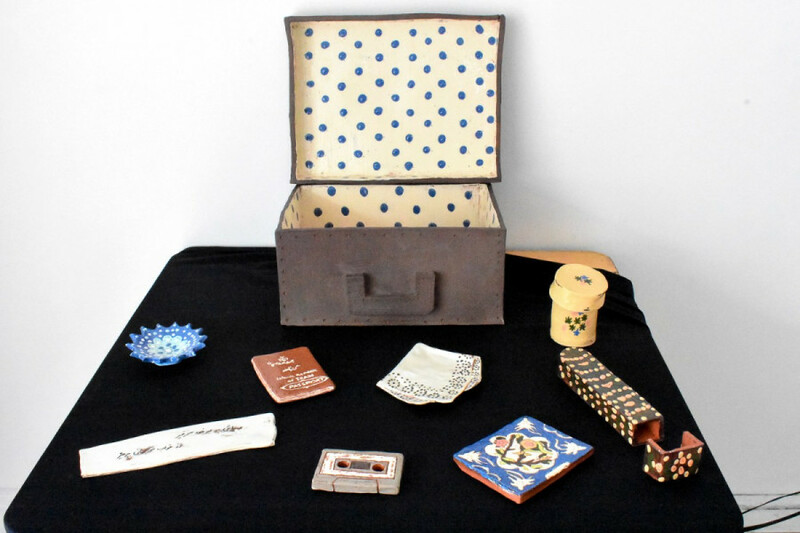 The artist shared that she wanted to show the process of packing and selecting things for their sentimental weight and value through her piece. She chose ceramic for its fragility; the material itself aligns with her message. “It represents the memories that you have with people in the past, they’re very fragile, you can forget them, you collect these objects to have this collection and archives of your memories,” she said. At 7 p.m., the crowd arrived and the ambiance of the space quickly became festive. The art sparked conversations, and the room steadily grew noisier and warmer. Telltale signs of a successful event. 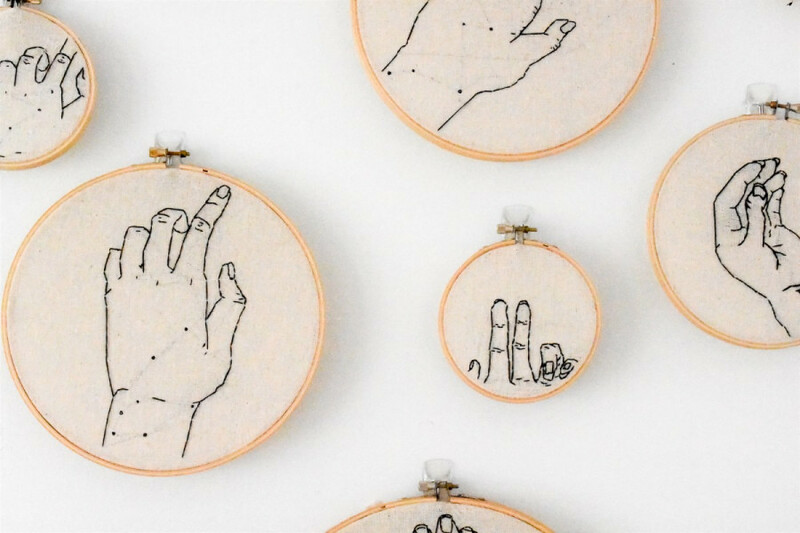 I stopped to take in Hands, a series of embroideries about “the process of making” by Zeke Best Rothfels. The embroidered hands are graceful, moving, still, and at times positioned at awkward angles. The composition of the 12 wooden hoops infuses life into the work, aligning the viewer with the artist’s perspective. Rothfels explained that the restrictive nature of embroidery, the delicate working with thread and fabric, opened conceptual possibilities. Beer and whiskey were passed around and the atmosphere became more festive. Amidst all this energy, Claudia Persechino’s piece de(restoration) stood stoically. Rooted in memory, personal experience and family bonds, the moving piece struck a chord with me. From a bag of unspun wool, Persechino worked the material until it became felt, from which she created this work. The tenderness emanating from the piece is almost painful. She explained that she wanted to do something with her grandmother’s house so she chose her bedsheet as the starting point for her project and just reproduced the bedsheet with the same patterns. “The connections between myth, and especially personal myth, and nostalgia and storytelling, and hand-crafted or carefully-rendered objects and images is a very interesting point that I was trying to get across, and I think that it’s something you could get in different ways out of each piece in the show,” Mills said.